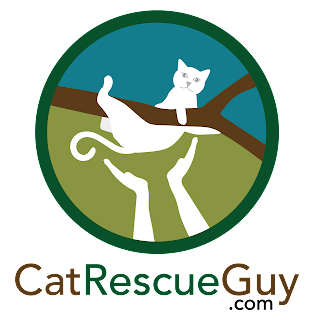 OrangeJello’s rescue is by far the most difficult rescue I have ever done. It is also the most painful rescue for me to recall, because, even though the outcome was successful, I feel like I failed. 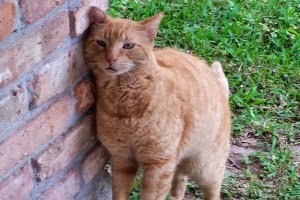 OrangeJello is a feral cat. He would allow his caretaker, Staci, to get close enough to him to feed him, but he did not want to be touched. 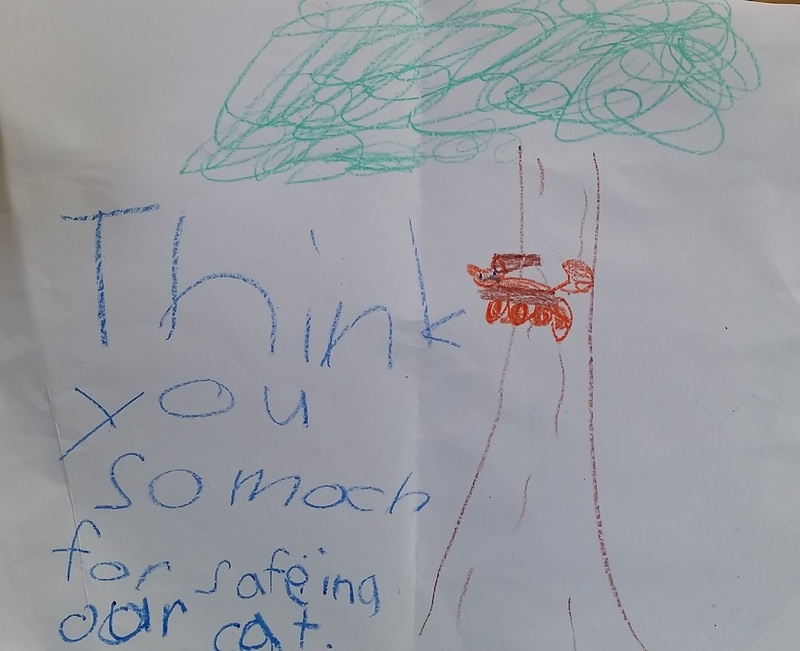 He was less than 20 feet high in an oak tree that was just inside a wild, wooded area, and he had been there for five nights before I arrived. The weather had been bad with lots of thunderstorms, and more rain was in the forecast and lots of it. Staci took this heart-breaking picture of him the day before I arrived. How can you look at him hanging on for life and crying desperately like this and not want to help! The tangled tree he was in was surrounded by large bushes and vines and just getting to the tree was very difficult. There was no place to stand fully upright because of the canopy of the privet over my head blocking my access to the tree and my view upward. I had to spend a lot of time just clearing a path to the tree and a space under the tree to work. Poison ivy was all over the ground and covering the trunk of the tree. The mosquitoes were bad and, to top it all off, the tree was full of stinging caterpillars which would frequently fall to the ground and on me. The tree was tangled with vines, both dead and alive, and there was no clear path to a good tie-in point for my rope high in the tree. I had much difficulty setting my line in the tree. What normally should take only a few minutes in most situations, took two hours this time because of all the obstacles both in the tree and on the ground. Just as I got my line set, however, the weather turned bad and the thunder and lightning started. I had to quit for the day and hope for better luck the next day. I hated to leave the cat in the tree another night, but the weather allowed me no choice. The next morning I arrived early to find that the cat had climbed up very high near the top of the tree. The limbs at that point were spaced too far apart to allow him to come back down any distance on his own, so I would have to climb all the way up there to get him. I started climbing the tree, but for various reasons progress was very slow. By the time I reached near him, we had both gone just about as high as we could go. He always stayed at least just out of arm’s reach. I always count on using food to get the cats to regard me as a friend rather than an enemy and to draw them closer to me. I held some cat food directly under his nose, and he showed no interest in it at all. That was when I realized that he was too stressed to think about food even though he should be starving for it. While his body language appeared to be relaxed enough, his vocalizations sounded more like warnings. He simply regarded me as a predator and had no intention of letting me get any closer to him. Scruffing him was out of the question because he always stayed out of reach. Even if I could scruff him, I am sure he would have fought back hard, and I am sure I would have dropped him while suffering bites and scratches. I had already ordered a special net for these purposes, but it was on backorder and had not arrived yet. I also did not have a rescue-pole. The only tool I had left was a carrier, and I tried all kinds of ways to either lure him or force him into it. I could get half of him in, but never all of him, and I tried for a very long time. He was exhausted. He was panting, his eyes were dilated, and he was drooling in spite of his state of dehydration. I was seriously worried that he would not survive more than a few more hours. He kept climbing higher onto limbs that were just barely strong enough to hold his weight. At this point, there were no good options left. If I backed off, he would have died in the tree. I thought the only option he had at this point was to jump, but we were somewhere around 50 to 60 feet high. Knowing that cats do have a good chance of surviving a fall that high, I thought that was the only option he had left. I encouraged him to jump by pulling slowly and gently on the limbs his feet were on. I wanted him to have time to see that falling was imminent and to prepare himself for it. Sensing that I might have one more chance to catch him in the carrier, I looked away to retrieve it. When I turned back, all I saw was the blur of his passing down toward the ground. The two people on the ground both heard the thump of his landing on the ground, but they did not hear him running away afterward. They looked through all the dense underbrush but could not find him. Once I reached the ground, I, too, looked for him but could not find him. 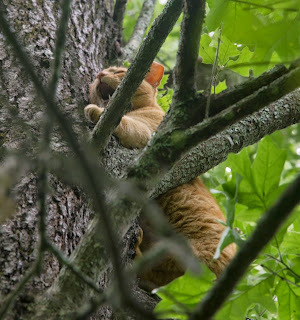 I looked in other trees to make sure he had not climbed another one, but did not see him. I left, encouraged by the fact that he must have survived the fall, but deeply worried about his condition. A few hours later, Staci called to let me know that OrangeJello had appeared on her porch ready for his supper. She snapped this picture when he appeared. He looked fine: no scratches, no limping. He seemed no worse for the wear. I felt so relieved and told her to watch him carefully and take him to the vet if anything appeared unusual. Even though I was greatly relieved, I still felt haunted by the ordeal. A few days later, Staci contacted me to say that Orangejello was still doing just fine. 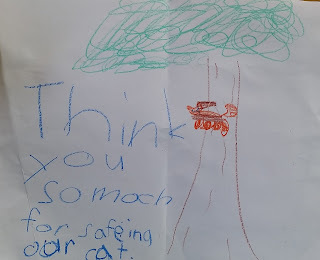 She also discovered a picture that her 7-year old daughter drew to thank me for saving her cat, and she sent it along to me. Seeing this priceless reward makes all the difficulties and misery of the rescue just fade away to nothingness. It was all so worth it.